When it comes to baking, I always try to experiment with new recipes and with exotic ingredients. One among them is Cheesecake. On my random visit to Godrej Nature's Basket, I picked up a packet of Ricotta Cheese. I was looking for recipes to use this Ricotta Cheese and a perfect time to make it. It took more than couple of weeks as some renovation work was going on at home and all I could see around was a mess, including me. Coming back to my cheesy affair, when I actually opened the can of ricotta cheese after 2 weeks, it was spoilt by then. Yes...ricotta cheese is highly perishable. With a broken heart (the cheese had cost a bomb!) and desire to make a Cheesecake, I decided to go easy on my pocket and make the Ricotta Cheese at home. Making Ricotta Cheese at home is very easy, the ingredients would always be available at home. Ricotta Cheese can be used for making Cheesecakes, lasagna or as a side serving with sliced fruits along with a drizzle of honey. Add the ingredients in a large sauce pan. Put the pan on a medium flame until the milk curdles. This would not take more than 5 minutes. In the meanwhile, line a of cheesecloth on a strainer and keep the strainer over a deep bowl/ jug. Pour the milk mixture through the strainer and let it drain for 15 minutes. 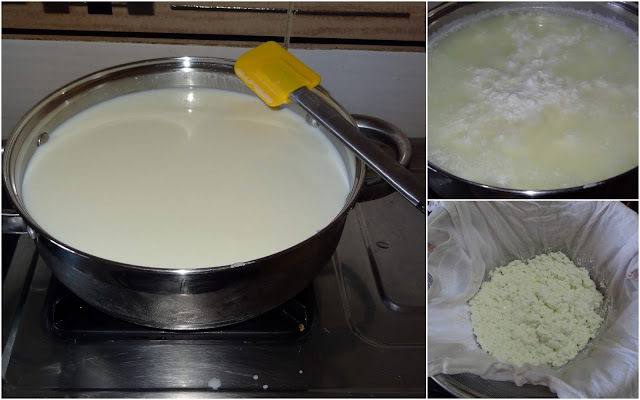 Gather the cheesecloth around the curd and squeeze gently to drain the excess liquid. Use the ricotta cheese when it is slightly warm or you can refrigerate for 2-3 days. You can even use the whey (the liquid from the cheese) for preparing dough for chapatis (Indian Flat breads). The whey is rich in proteins and minerals.